The Isles magic number to clinch a playoff spot remained six as both Boston and Ottawa won on Tuesday. In order to clinch a playoff spot, the Isles need to finish ahead of one of these five teams: Pittsburgh, Washington, Detroit, Boston or Ottawa. Isles have 95 points, 38 regulation/overtime wins (ROW) & 5 games to play. The Isles were idle Tuesday. They can finish with a maximum of 105 points. Pittsburgh has 95 points, 38 ROW and 6 games to play. Pens were idle Tuesday. They can finish with a maximum of 107 points. Washington has 94 points, 38 ROW and 5 games to play. Caps beat Carolina Tuesday. They can finish with a maximum of 104 points. Detroit has 93 points, 37 ROW and 6 games to play after their shootout loss vs. Ottawa. They can finish with a maximum of 105 points. Boston has 91 points, 36 ROW and 5 games to play after their win vs. Florida. They can finish with a maximum of 101 points. Ottawa has 88 points, 32 ROW and 6 games to play after their SO win vs. Detroit. They can finish with a maximum of 100 points. Florida has 85 points, 27 ROW and 5 games to play after their loss to Boston. They can finish with a maximum of 95 points but cannot catch the Isles in ROWs so the Isles are now guaranteed to finish ahead of the Panthers. The Islanders are in Columbus, Boston is in Detroit, Ottawa hosts Tampa Bay and Washington is in Montreal on Thursday. None of these teams play Friday, but they all play Saturday: Isles host Buffalo, Pittsburgh is at Columbus, Washington is at Ottawa, Detroit is at Minnesota and Boston hosts Toronto. Isles win twice (Thursday/Saturday) and Ottawa does not win twice. The Isles still have home-ice in their control -- here's how -- if the Isles win their last 5- all in regulation, they will finish with 105 points and 43 ROW. Since one of those five games is against Pittsburgh, the best the Penguins could do is 105 points and 43 ROW but the Isles have already won season series with Pittsburgh, and that is the next tie-breaker! 25 years ago tonight (1990) – In retrospect, maybe this wasn’t the best thing that happened to the Islanders. Some could argue that it was even the worst. Entering play on the final Saturday of the most up-and-down season in Islander history, the Islanders trailed the 4th place Penguins by one point for the final playoff spot. Pittsburgh had already guaranteed that they would finish with more wins than the Islanders , so the Isles had only one shot – beat Philadelphia at home and have the Penguins lose to Buffalo. Brent Sutter did what he could scoring twice for the Isles, but the Flyers scored in the first minute of both the first period and second period so the game was tied 2-2. Jari Gronstrand scored the 8th (and final) goal of his NHL career at the 3:20 mark of the second period and when David Volek scored 64 seconds later, the Islanders had some breathing room. Pat LaFontaine and Don Maloney would turn the game into a rout with third period goals and the Isles had a 6-2 win. Then it was up to the Sabres. With the Coliseum crowd watching on the (then-new) center ice scoreboard, the Penguins, with Mario Lemieux back in the lineup after missing 21 games with a herniated disc, and Buffalo headed into overtime. Sabre defenseman Uwe Krupp, who would become an Islander in a trade just 19 months later, scored the overtime goal that knocked the Penguins out of, and the Islanders into, the playoffs. Here's Krupp's goal that knocks the Penguins out, and the Isles in. The Isles, who managed to make the playoffs despite a 1-14-5 stretch, would meet the first place Rangers in the playoffs. Al Arbour understood that what the Isles had accomplished was a bit remarkable and a bit unbelievable, telling Newsday’s Mark Herrmann: “The other fellows set the examples. It's up to these fellows to carry the torch through…The Good Lord was watching over us; we got a lot of help, and we'll accept it graciously." “The Islanders made the playoffs because a series of five games involving the Islanders, Penguins and Flyers worked out precisely the right way for them. It was a 241-2 shot, according to Eric Hornick, an actuary who spends his spare time as an Islanders' historian / statistician for SportsChannel and the team publication. He figured the odds based strictly on possible outcomes, disregarding factors such as home-ice advantage and winning streaks." The Isles would overcome similar odds 17 years later when they rallied to sneak into the dance on the season’s final day. The Isles would fall to the Blueshirts in the first round. But the longer lasting issue was that by qualifying for the playoffs, it pushed the Islanders to the 6th spot in the 1990 Entry Draft. What’s the difference in one spot? How about Jaromir Jagr vs. Scott Scissons? Of course that means the Isles also passed up Daryl Sydor and Derian Hatcher. The two defensemen were picked 7th and 8th and each played over 1,000 NHL games. Also on this date: (1988) – In the final regular season home game of Denis Potvin’s career, the Isles moved close to clinching first place in the Patrick Division with a 7-3 win over Washington. The Isles announced that Potvin would become the first Islander in the team’s “Hall of Fame”; his jersey would be retired weeks before Mike Bossy’s was, in 1991. Potvin also received NHL milestone awards from John Ziegler honoring him for 1000 NHL games and 1000 NHL points. Also on this date: (1979) - Chico Resch blanked the Buffalo Sabres 2-0. Bob Nystrom and Bob Bourne scored for the Isles, who remained 2 points behind the Canadiens for first place overall. All-time, the Isles have played nine March 31st games at the Coliseum and finish with a 5-4-0 record on this date at 1255 Hempstead Turnpike in Uniondale. 22 years ago tonight (1993) – Pierre Turgeon broke a 1-1 tie midway through the third period as the Islanders defeated the Philadelphia Flyers 2-1 and moved into 4th place (the final playoff spot) in the Patrick Division. Heck of a hockey player too. The win, the Isles’ 7th in nine games with the Flyers that season, gave the Isles 78 points, and a one point lead over the Rangers. Both the Isles and Rangers had nine games to play, but it was the first of those games that would help shape the season—the Good Friday Islander overtime win three nights later on Pierre Turgeon’s 50th goal of the season. The Isles would eventually win this banner -- it would hang in the Coliseum for only one season. Here's the overtime from the Isles-Rangers game three nights later from the Garden. I worked with Jiggs/Eddie that night, but all I could find is the Ranger call with Sam and JD. Also on this date: (1991) – Tom Fitzgerald and Hubie McDonough each scored twice as the Isles ended the home campaign with a 5-3 win over Boston. 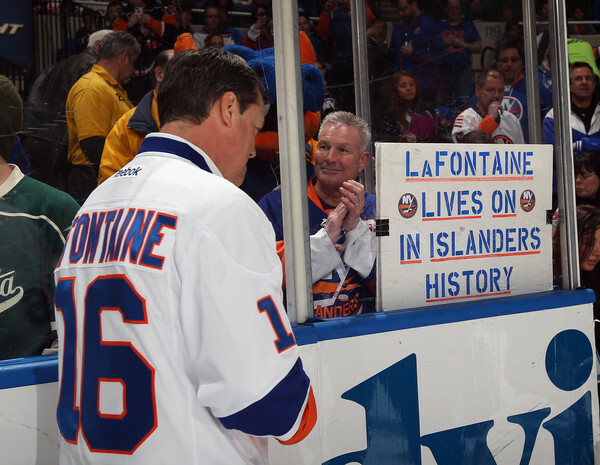 It would have been hard to believe at the time, but it was Pat LaFontaine’s final Coliseum tilt as an Islander. All-time, the Isles have played four March 30th games at the Coliseum and finish with a 2-2-0 record on this date at 1255 Hempstead Turnpike in Uniondale. The Isles magic number to clinch a playoff spot was reduced to 6 with their win over Detroit and Ottawa's loss to Florida. In order to clinch a playoff spot, the Isles need to finish ahead of at least two of these three teams: Boston, Ottawa and Florida (they would also clinch a spot if they finish ahead of Washington). Boston has 89 points, 35 ROWs and 6 games to play. They can finish with a maximum of 101 points. Ottawa has 86 points, 32 ROWs and 7 games to play. They can finish with a maximum of 100 points. Florida has 85 points, 27 ROWs and 6 games to play. They can finish with a maximum of 97 points. So, any Islander win or Florida regulation loss will mean the Isles will finish ahead of the Cats. Florida is at Boston, and Ottawa is at Detroit on Tuesday. Boston is in Detroit, Ottawa hosts Tampa Bay and Florida hosts Carolina on Thursday. If Ottawa wins either of their next two games, the Isles can not clinch until at least Saturday. The Isles can not clinch a spot over Boston until at least Saturday. Some other numbers -- the Isles' magic number to finish ahead of Washington is 10 points. The Isles' magic number to finish ahead of Pittsburgh is 13 points. The Isles once again, thanks to San Jose forcing a shootout, have home-ice in their control -- here's how -- if the Isles win their last 5- all in regulation, they will finish with 105 points and 43 ROW. Since one of those 5 is against Pittsburgh, the best the Penguins could do is 105 points and 43 ROW but the Isles have already won season series with Pittsburgh, and that is the next tie-breaker! Cal Clutterbuck's shorthanded goal proved to be the winner as the Isles erased an early 2-0 deficit in a 5-4 win over the Detroit Red Wings, before yet another sellout crowd of 16,170 at the Nassau Veterans Memorial Coliseum. The Isles connected for 3 power play goals; it's the first time this season that they have scored three power play goals and the first time since January 4th that they have scored multiple power play goals. Pittsburgh beat San Jose 3-2 (shootout) to remain ahead of the Isles in the battle for second place in the Metropolitan Division; the teams each have 95 points but the Penguins have a game in hand. Washington beat the Rangers 5-2; the Caps remain three points behind the Isles but Washington also has a game in hand. The Isles improve to 4-7-3 in their last 14 games but end March with a sub-NHL .500 record (4-6-3)… Pavel Datsyuk's power play goal ended the Isles franchise record streak of 12 games without allowing a power play goal; it was the only power play goal the Isles allowed in March…The Isles had allowed only two goals in the first two minutes of a game all season (Brandon Sutter in Pitt and PK Subban in Montreal) before allowing 2 in first 1:46 today…Each team scored 3 first period goals; the first time that has happened in an Isles game since April 7, 2011 in Philadelphia…The Isles scored 3 PP goals in a game for the first time this season; they also scored 3 PP goals and a SH goal in the same game for the first time since October 30, 1997 vs. the Rangers…John Tavares matched a career high with three assists; he ended the night two points behind Sidney Crosby for the NHL lead…The Isles are 9-0-0 when scoring a SH goal; only Winnipeg (10) has scored more SH goals this season…Tomas Tatar's goal was his 100th NHL point…The Isles have won 56 of their 57 games when scoring 5 or more goals (56-1-0)…Brock Nelson's PP goal was his 10th, joining John Tavares (12) in double-digit PP goals; the last Isles teammates with 10+ power play goals were Jason Blake (14) and Mike Sillinger (11) in 2006-07...Matt Martin had 4 hits, giving him an NHL -record 377 on the season and breaking his own record of 374...Ryan Strome has a point in three straight games…The Isles have now scored 72 first period goals; only the Rangers (73) have more. The Isles are 37-17-5 in the 59 games that they have had Nick Leddy, Johnny Boychuk and Travis Hamonic all in the lineup. They are 8-10-0 in the 18 games that one or two have been missing. All three now have at least 30 points; it's the first time that the Isles have had three defensemen with at least 30 points since Adrian Aucoin, Kenny Jonsson and Roman Hamrlik did so in 2001-02. This was the 26th time this season that the Isles, their opponent, or both had played the day before. The Isles are 16-3-1 against an opponent playing on back-to-back days but are 1-5-0 when the Isles are playing on the back-end of back-to-backs against a rested opponent. · The Isles are 8-1-0 when both teams played the night before. This will happen for the final time this season on April 11th vs Columbus. · NY Rangers 47-21-7=101 points / 75 games (43 ROW) Lost to Washington 5-2. · ISLES 45-27-5=95 points / 77 games (38 ROW) Beat Detroit 5-4. · Washington 41-25-10=92 points / 76 games (37 ROW) Beat NY Rangers 5-2. The Isles have sold-out 25 of their 39 home dates this season, including each of the last eight dates. The 25 sellouts are the most for the Isles since the 1980s. The Isles have drawn at least 15,000 fans 30 times this season. The Isles are 45-27-5 thru 77 games, representing their most wins since 1983-84 (50). The Isles are 24-14-1 on Coliseum ice, representing their most home wins since 2003-04 (when they finished 25-11-4-1). The Isles have had a season of streaks, going 4-0-0 to open the season and then (in succession) 0-2-0, 2-0-0, 0-3-0, 13-2-0, 0-3-0, 7-1-1, 0-2-0, 6-1-0, 1-4-0, 6-1-0, and 4-2-3 before going 2-6-1 in their last nine games. The Isles have outshot 41 of their last 48 opponents and 58 of their 77 opponents this season. The 58 times outshooting their opponent is the highest total in the NHL this season. On the season, the Isles have outshot their opponents 2,589 - 2,162 for a +427 shot differential. The Isles need just 28 shots on goal to establish a new franchise record. The Islanders are 45-27-5 overall; 24-14-1 at home and 21-13-4 on the road. The Isles have at least 21 wins both at home and on the road for the first time since the 2001-02 season, when they won 21 at home and 21 on the road. Detroit is 40-23-12 overall, 21-8-8 at home and 19-15-4 on the road. The Isles are 20-5-1 in Division games and are 25-22-4 in games against other divisions. They are 11-10-2 vs. the Atlantic Division, 6-6-2 vs. Central Division, and 8-6-0 vs. the Pacific Division. With this win, the Isles are assured of finishing at NHL-.500 or better against all four divisions. Jaroslav Halak made 21 saves and improves to 36-16-2 on the season. He is 6-4-1 in his career against Detroit. Petr Mrazek was pulled after allowing the first 4 goals, making just 7 saves. However, Jimmy Howard, who allowed 1 goal on 16 shots gets saddled with the loss (21-13-10 on the season). Howard is 1-3-1 in his career against the Isles. The Islanders were 3-4 on the power play, while Detroit was 1-3. The Isles also scored their 9th SH goal of the season, and improved to 9-0-0 in games in which they have scored shorthanded. The power play is 4-10 (40%) in the last three games. The penalty kill has killed 50 of 55 (90.9%) in the last 22 games; the Isles allowed two goals to Vancouver on February 22nd, two goals to Carolina on February 28th and one goal to Detroit on March 29th but blanked their other 20 opponents. The Isles have killed 30 of the last 31 opponent power plays; in their last nine road games, the Isles have killed all 19 opponent power plays. The Isles are 25-11-1 when they score at least one power play goal and 20-16-4 when they do not. The Isles are 16-16-0 when they allow at least one power play goal and 29-11-5 when they do not. The Isles are 38-7-2 when they score at least three goals (including shootout winners) and are 7-20-3 when they do not. The Isles are 26-9-5 in games decided by a single goal including 13-9-0 in regulation. They are 6-1 in games decided in overtime and are 7-4 in shootouts. Six games have been decided by two goals in which the second goal was an empty-netter. The Isles are 3-3 in those games. The 26 wins are a new franchise record – in 2007-08, 23 of Isles' 35 wins were by 1 goal. 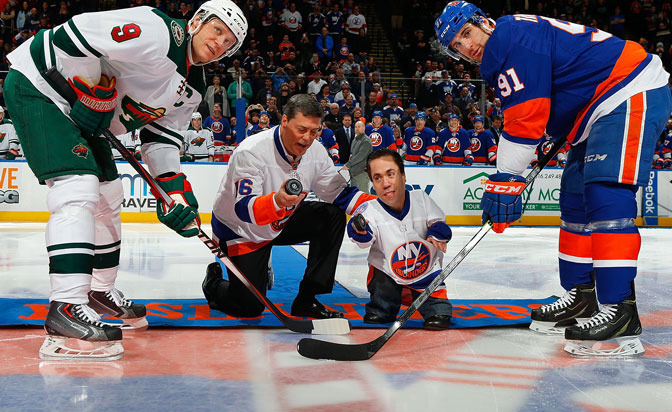 Jack Capuano is the 2nd winningest coach in Islander history. Capuano is 163-147-44 behind the Islander bench. Among the 9 New York teams, only the Giants' Tom Coughlin and the Yankees' Joe Girardi have led their respective teams longer than Capuano. John Tavares on the early deficit: "We had 58 minutes to go. It wasn't the way we wanted to start, but credit to our team for digging deep and staying with it." Kyle Okposo: "We had a spell there where we definitely weren't playing our best and weren't able to pull out wins, so hopefully we will be a stronger club for it moving forward." "This team has been resilient all year…not the start we wanted, a couple of fluky goals, but …special teams came up big for us." The Isles are 9-5-1 in the front-end and 9-6-0 on the back end of back-to-backs this season. The Isles have swept 5 sets of back-to-backs, are 1-1-0 in eight sets, are 0-1-1 in one set, and have been swept once. The Isles' final back-to-back will be in games 81 and 82, on April 10-11 (at Pittsburgh, vs Columbus). Travis Hamonic led all Isles with 24:40 of ice-time. Niklas Kronwall led Detroit in ice-time with 25:28. Isles record by ice-time leaders: Johnny Boychuk (13-5-1), Travis Hamonic (21-7-2), Lubomir Visnovsky (2-1-0) John Tavares (2-6-1), Thomas Hickey (4-0-0), Nick Leddy (0-5-1), Frans Nielsen (1-0-0), Kyle Okposo (0-1-0), Brian Strait (1-0-0) and Calvin deHaan (1-2-0). John Tavares led Isles forwards with 19:29. Isles record by Forward ice-time leaders: John Tavares (27-25-5), Kyle Okposo (12-1-0), Ryan Strome (1-0-0), Brock Nelson (1-1-0), Anders Lee (1-0-0), Frans Nielsen (1-0-0), Casey Cizikas (1-0-0) and Josh Bailey (1-2-0). The Islanders won 31 of 55 draws (56%). Frans Nielsen won 15 of 20 for the Isles while Luke Glendenning won 7 of 13 for Detroit. After winning 23 of 45 in the first two periods, the Isles won 8 of 10 in the third period. The Isles won 3 of 7 on the power play and 5 of 9 on the penalty kill. The Isles were out-hit 20-18. Matt Martin and Brock Nelson led the Isles with four hits each. Matt Martin leads the NHL with an NHL-record (since 2005) 377 hits while Cal Clutterbuck is 2nd with 323. The Isles were credited with 17 blocked shots; Brian Strait and Josh Bailey led the way with 3 each. The Isles finished with a total Corsi advantage of 53-51. The Corsi stat measures shots attempted, both for and against (including blocks). Detroit had only one attempt (and 0 shots on goal) in the first 10 minutes of the third period. Brock Nelson led the Isles with a +8 even-strength Corsi rating; Nelson was also on-ice for a team-leading 70% of Corsi For events. Tomas Tatar led Detroit with a +9 rating. Islander Captain John Tavares has 392 career points; he is 83 points ahead of Matt Duchene for most among 2009 draft picks. No other player in that draft is anywhere close. Tavares also has more goals and more assists than any other player in that draft. The Islanders improve to 24 games over all-time NHL .500 (1450-1426-455 in 3,331 games). Nikolay Kulemin and Brock Nelson are the Islanders' reigning ironmen. Kulemin has played 145 consecutive games (68 for Toronto and 77 for the Isles) while Nelson has played 130 consecutive Islander games. John Tavares is the only other Islander to have played every game this season. Mikhail Grabovski is on injured reserve. Calvin deHaan, Matt Donovan, Michael Grabner, Colin McDonald and Eric Boulton were scratched. The Isles have lost 266 games this season due to injury/illness. The Isles win the season series 2 games to 1 (and 4 points to 2). The Isles have won four of the last five Coliseum match-ups between the teams and are 4-1-3 in their last 8 on Long Island against the Red Wings. Overall, the Isles are 9-2-1 in their last 12 games vs. Detroit. Palffy's goals gave him 5 goals in the back-to-back set as the Isles improved to 4-0-1 in five games since acquiring Reichel from Calgary. All-time, the Isles have played twelve March 29th games at the Coliseum and have compiled a 7-3-2 record on this date at 1255 Hempstead Turnpike in Uniondale. The Sound Tigers are 25-35-6-1, following a 4-1 win in Binghamton on Saturday and a 4-3 loss to Hershey on Sunday. Ryan Pulock scored power play goals in both games; 12 of his 15 goals have come on the power play. The Isles have only five games remaining in the season and two of them are against the Columbus Blue Jackets. The Isles have scored 11 goals this season in two wins (5-2 and 6-3) over the Blue Jackets. However, Columbus, who will play on Tuesday before hosting the Isles Thursday, has been red-hot, winning their last six games.